Need more information about booking Home 6236416 ? Beautiful new apartment, with stunning views, in a quiet cul de sac on Fuerteventura golf course. 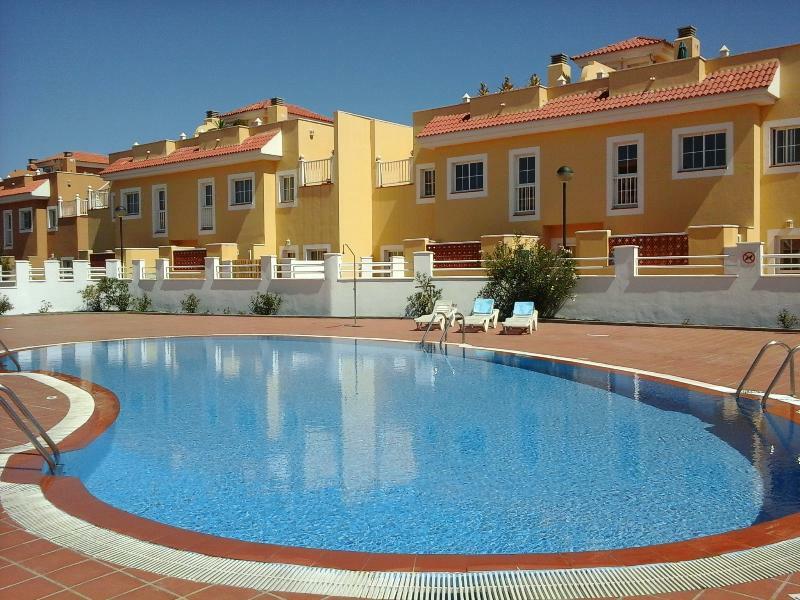 It is in the perfect location, only 5 minutes walk to Atlantico centre with a large Eurospar supermarket, shops, bars and restaurants with views to the sea. Just along the promenade are several lovely white sand beaches, great for all the family. 2 bedrooms, 1 with kingsize bed and a great view over the golf course, the other with twin beds. Large family size bathroom and fully fitted kitchen. Lounge/ dining room with stunning views to neighbouring golf course and the sea. 3 seperate outside terraces, 1 covered, 1 sun terrace, 1 bbq area. Shared pool is just outside the front door, with ample space for lounging in the sun. Free wifi is available via ADSL and also provides multiple television channels in English. You can get in touch with Donna (the owner) through the contact form on this page. Send Donna (the owner) an email through the contact form on this page. Alternatively, if there’s a phone number on this page, you can call them. How do I contact Donna (the owner)? You'll need to send Donna (the owner) an enquiry to book - the owner will let you know how to pay. If they accept online booking they'll send you a quote and info on how to pay. If you pay through our website you’ll be covered by Payment Protection. Or you can send Donna (the owner) an enquiry through the contact form to request a quote. Donna (the owner) will email you the total cost for your dates and how to pay. Send Donna (the owner) an enquiry through the contact form requesting a quote for your holiday dates. Donna (the owner) will email you the total cost for your dates and how to pay. Donna (the owner) of this property is responsible for taking and refunding your damage deposit. The damage deposit terms should be agreed before booking and outlined in the booking contract, if Donna (the owner) supplies one. Please refer to these details or contact Donna (the owner) directly if you have any questions. You'll need to contact Donna (the owner) to cancel. They should have provided their contact details when you made your booking - otherwise, email them through the contact form. You'll need to contact Donna (the owner) to edit your booking. They should have provided their contact details when you made your booking - otherwise, email them through the contact form.